The gharial's range is India, Nepal, and Pakistan. Gharials inhabit fast rivers with deep pools and sandy or muddy banks. Gharials are clumsy on land, as their leg musculature does not allow them to raise their body or tail off the ground. They can, however, belly-slide quickly if need be. They are the most aquatic member of the order, and leave the water only to bask or nest, usually on a sandy river bank. They spend much of the time lying just under the surface of the water, with only the eyes and nostrils exposed. Despite their enormous size, they tend to avoid rather than attack people. The long and narrow jaws are not strong enough to grasp and tear apart large prey as other crocodiles do for food. 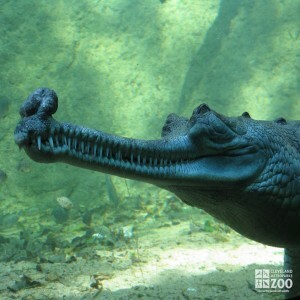 Female gharials reach sexual maturity at about 9 feet in length and usually over 10 years of age. Males guard a harem of several females. Mating period occurs for 2 months during November, December and January. Nesting is in March, April and May (the dry season), when hole nests are dug into sand banks. The eggs are deposited into the hole before it is covered carefully. Gharial eggs are the largest of any crocodilian species, weighing on average 5.6 ounces. After the incubation period of 60 to 90 days, juveniles emerge. The female has not been observed assisting the hatchlings to the water as in other crocodilian species; however, the young are protected around the nesting area after hatching.